What happens when cultural institutions that have been around for centuries have to confront the reality of a fast-paced society, strongly embedded in technology and the ever-changing digital world? The answer is simple. They have to adjust their functionalities, less they become irrelevant to the next generation of audience (or, some might say, users). This is exactly what the Rijksmuseum in Amsterdam has done with the relaunch of their website Rijksmuseum.nl and the initiation of a novel digital platform called Rijksstudio. In only a matter of years, the latter has become a benchmark for connecting people in the Netherlands - indeed all over the world - to one of the most significant museum collections. Today, the platform features over 325,000 works of art, hosts 360,000 individual accounts from active users, has witnessed over 2 million free downloads and is allowing people to create their own personal collections, with over 200,000 already on record. The statistics are staggering, and make a strong case for museums to put more of their collections and archives in the public domain. But how did it all start? And how feasible might it be for other institutions to replicate the model of open access? 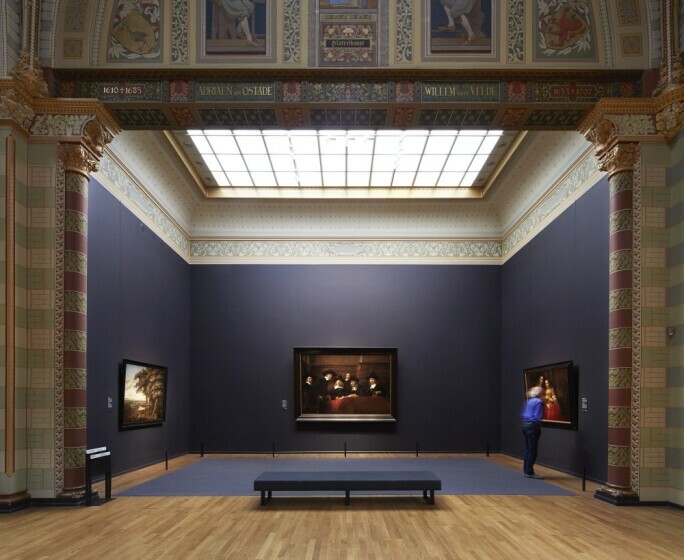 The Rijksmuseum’s evergreen mission to connect people, art and history established the need to create a platform that would give people the opportunity to enjoy the collection of one million works of art (of which only 8,000 are on display) online. But the digital team at the Museum went one step further: they allowed users to work with digital works of art free of charge, even allowing images to be used for commercial purposes. 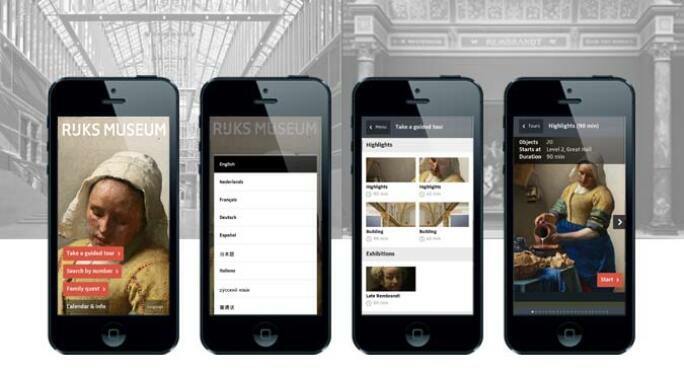 With Rijksstudio, more than 330,000 works of art are at your fingertips. Much like platforms such as Pinterest, viewers can zoom in, crop, share and like works in the collection in a somewhat social space. Visitors can even compile personal collections inspired by themes ranging from chiaroscuro to pets in Old Master paintings! According to the Rijksmuseum's digital and marketing teams, the open access strategy has greatly contributed to a rejuvenation of the museum's public perception or 'brand'. Moving away from a traditional and outdated reputation as a major European museum where academic knowledge preceded full appreciation for works of art, the Rijksstudio has aligned itself with other digital content platforms, nearly putting the curatorial expertise in the hands of the public. What the public does with these images is equally worthy of admiration. Since launching, works in the Old Masters collection have seen new light, with tens of thousands of creative products made thanks to the commercial licensing approvals and a fortuitous collaboration with Etsy. Everything from wallpaper and high-fashion dresses to sleeping masks and throw pillows have drawn on the images of the museum's collection for inspiration. 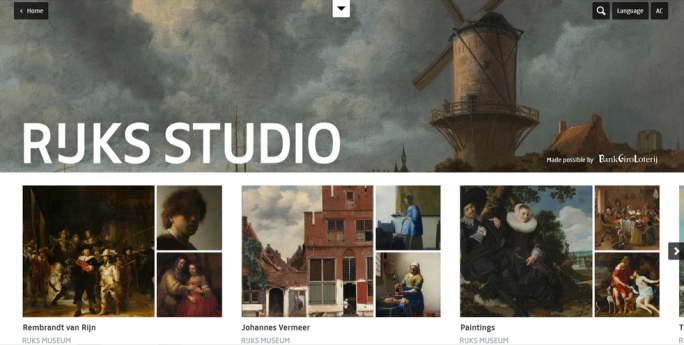 To this end, the Rijksmuseum has been working over the past two years on combining the Rijksstudio website and the already existing Rijksmuseum app in accordance with the increasing shift towards mobile. 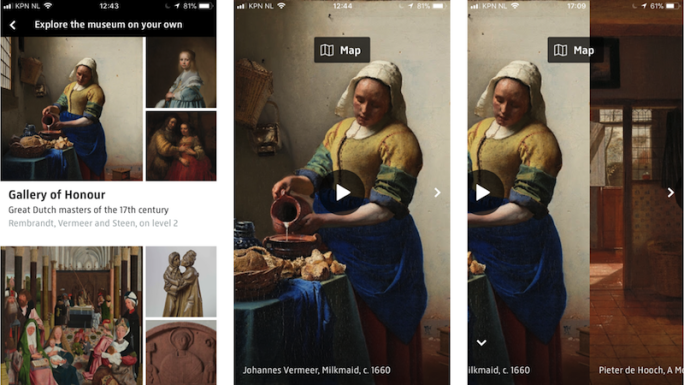 In response to 'mobile first', a major redesign of the app combines Rijksstudio, multimedia tours and e-tickets in one single interface. Meeting the standards of a non-linear, culture snacking society, the app guides visitors around the museum to a certain extent, leaving them free to explore the museum on their own based on their preferences or by taking them through a themed guided tour if that is what they prefer. In today's world, then, it would seem that museums might soon be open 24/7, accessible to anyone, any time, no matter their accessibility limitations or level of background knowledge. This democratization of access and orientation toward 'art for all', combined with an easy-to-navigate user experience permitted the Museum to reach and engage with a broader audience. In the end, investments in digital have boosted the intrinsic brand value of the Rijksmuseum well beyond the small profits made on image licensing or even ticket sales. Given the ever-present effort to remain relevant in changing times, this might very well be a trend we see picking up steam at museums of all types and sizes in the years to come.